Crucial presents 8GB Ballistix Sport, Tactical and Elite DDR3 modules. Crucial, a leading global brand of memory and storage upgrades, today announced the immediate availability of 8GB DDR3 memory modules across the Crucial Ballistix Sport, Tactical, and Elite series. By taking advantage of Micron’s 4Gb DRAM technology, the new 8GB modules provide users with the maximum capacity, performance, and density needed to run data-and graphic-intensive applications smoothly and efficiently. Available in low-latency DDR3-1600MHz and DDR3-1866MHz modules, Crucial 8GB Ballistix modules can be installed in configurations up to 64GB in some systems, including the new Intel X79 platforms. Additionally, the complete line of Ballistix memory features a new logo treatment and updated heat spreader designs. The new Crucial Ballistix Sport 8GB DDR3-1600MHz memory module is designed to provide mainstream users and general PC enthusiasts with an affordable, reliable, no-hassle gaming experience. The Crucial Ballistix Sport series offers timing and voltages for maximum memory stability and system compatibility. Well-suited for gamers, power users, and performance enthusiasts, the new Crucial Ballistix Tactical 8GB DDR3-1600MHz memory has lower latencies and features the Intel Extreme Memory Profile (XMP) which enables easy setup. The Crucial Ballistix Tactical series provides high speeds and features a black PCB and enhanced heat spreader design for improved thermal performance. Designed for extreme overclockers and advanced users, the new Crucial Ballistix Elite 8GB DDR3-1866MHz memory utilizes Intel XMP, and features a thermally efficient extruded aluminum heat spreader design, black PCBs, and integrated thermal sensors for real-time monitoring of temperature utilizing the Ballistix Memory Overview Display (M.O.D.) utility. Crucial Ballistix memory is backed by a limited lifetime warranty and is rigorously tested to meet or exceed the high-quality performance specifications customers have come to expect from Crucial. 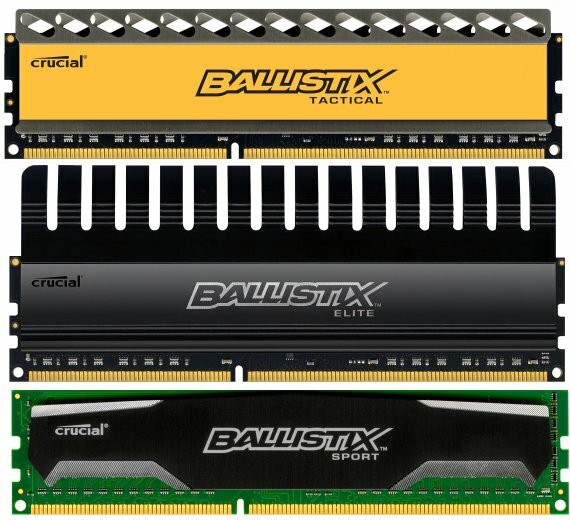 Crucial Ballistix Sport, Tactical, and Elite memory modules are available now through select global channel partners, or directly at www.crucial.com.